"Could everybody please be quiet for a second I kaaann't heeear dee maaashupppzz!" Photo by Aman About Town. Plus my recipe for tangy chicken surprise. Holy Crap, LA; San Francisco is my (mostly) happy home, but right now you're secretly my favorite. Don't tell the hippies! Bootie LA was a smashing success on Saturday night--too much of a success, to be honest; the Echo hit capacity before 11:30pm, leaving a long line of people out in the unseasonable cold. I'm still not exactly clear on how many people couldn't get in, but if anyone out there reading this had trouble, please accept all of our sincere apologies. Understandably, the energy inside the venue was a little bonkers, and my set was a ton of fun, although I had a bit of a scare at the end: in SF, I put my silly robot helmet back on to do the "thankyous" over the last song, but in LA, when I went looking under the DJ table for the helmet, it was gone. Ulp! Somebody stole my helmet! But, thankfully somebody handed it to me a few minutes later, and I was told that apperently people had been passing it around and wearing it as they danced about the stage. Oh, you crazy kids. Pictures of that are coming soon, but in the meantime here's some blog coverage from Aman About Town, as well as his Flickr set, plus FWY OK had a good time too. Thanks to everybody who came out, I'll be back in May. 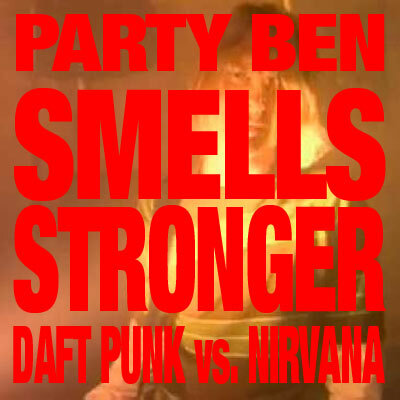 Daft Punk vs. Nirvana - "Smells Stronger"
Like I said below, these are perhaps the two most mashed-up songs ever in history (outside of Eminem's "Without Me"), and so this is kind of dopey, but as part of the show it works okay. 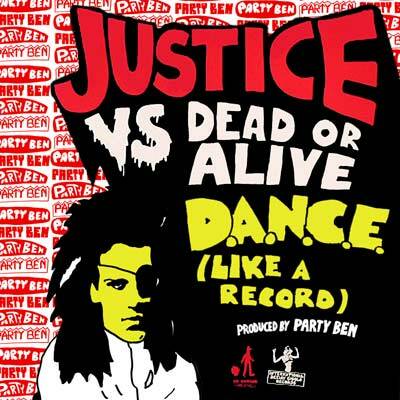 Justice vs. Dead or Alive - "D.A.N.C.E. 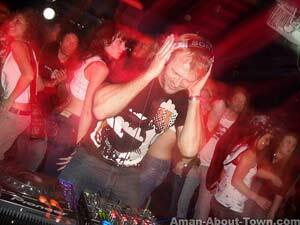 (Like a Record)"
Honestly this was inspired by DJ Zebra who would end his sets with the MSTRKRFT mix of "D.A.N.C.E." all the time, so I'm like, "what goes with that?" Pete Burns goes with that. Again, silly, and I probably worked harder on the cover than the actual mashup, but hey, at least I'm still trying, right? Weridly enough, at the exact same time as my set at the Echo, I had a guest mix going on Paul V's Indie 103.1 disco dance party show, "Neon Noise." It's suitably electro-riffic and kind of steals a couple things from recent Jokers of the Scene mixes, but it's got the secret "Galvanize the Empire" rerub in it plus other techno ridiculousness. You can download an mp3 of the whole thing and see a tracklisting on the Long Mixes page. And finally, there's been a little bit of Party Ben press recently; nothing like a front-page feature on a Green Day mashup or anything (sigh) but we take what we can get these days. First up, the Sacramento Bee mentioned me in a weird little article on, um, "modern media gems," that recommendes mashups, in general, as a diverting entertainment option. Neat. They tell readers to just "Google 'party ben,' 'bootiesf' or 'digitaleargasm' to get started." What's a Digital Eargasm? Also, the University of Maryland's Diamondback student newspaper included a reference to "Tender Umbrella" in a review of a recent English Beat show, and I'm going to bet Dave Wakeling is sick of hearing about it at this point. Featuring Smash-Up Derby, Warper upstairs with guests Moldover and Evolution Control Committee & his Wheel of Mashup, plus downstairs special guest DJ Fox, Midnight mashup show from Monistat. Regulars Adrian, Mysterious D, Dada and me. 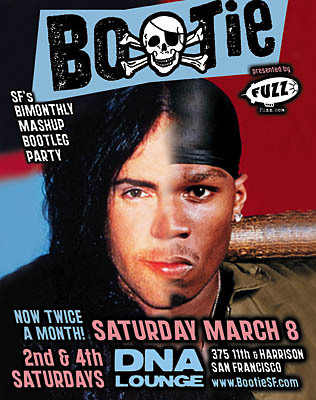 Featuring DJ P, the mastermind behind "Uneasy Listening," plus Electro-Bootie upstairs, featuring guest DJs C-Section & Jerk Party, and regulars Adrian, Mysterious D, Dada and me. Featuring Adrian & Mysterious D and myself. We're bringing some Bootie to SLC!